Mangoes are known as the “king of fruits”, and the reason being for this is the health benefits it offers. Mangoes are a great source of Vitamins A and C, and are filled with fiber content. Rich in iron, Mango juices are great for pregnant women and anemic people. 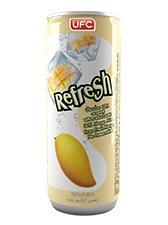 Our Refresh Mango is produced from ripe “Keaw” mangoes, going our juice great flavours as well as health benefits.